Assembly EP is composed of 5 rhythmic noise tracks. Assembly is some dark & rusty electronics beats with low tech attitude for industrial themes. Edgeist is an industrial / noise solo project started on late 2005 in Lyon (France). 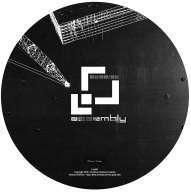 Assembly is my fifth release. My musical main concept is the creation of harsh metallic soundscapes under the rhythmic flux of noises. I can define my music as rhythmic & ambiant noise. Low-tech attitude, grinded beats and corroded electronic sounds.